Adventures can be hard to come by. There’s never a right time to indulge: commitments take priority, monetary constraints dwell in the back of minds, and inertia takes hold. With these caveats looming, a group of us managed to circumnavigate our professional rigor and escape for 10 days. The plan was initiated by the euphoria that coincides with a few too many whiskey gingers. On a random Thursday in late March, four of us met to celebrate our recent life accomplishments (of which the are always many) and hatched a road trip. It was the type of grand plan often chalked up to drunk talk with great friends. This time, however, before the hangovers subsided maps of potential routes had already been circulating by email. 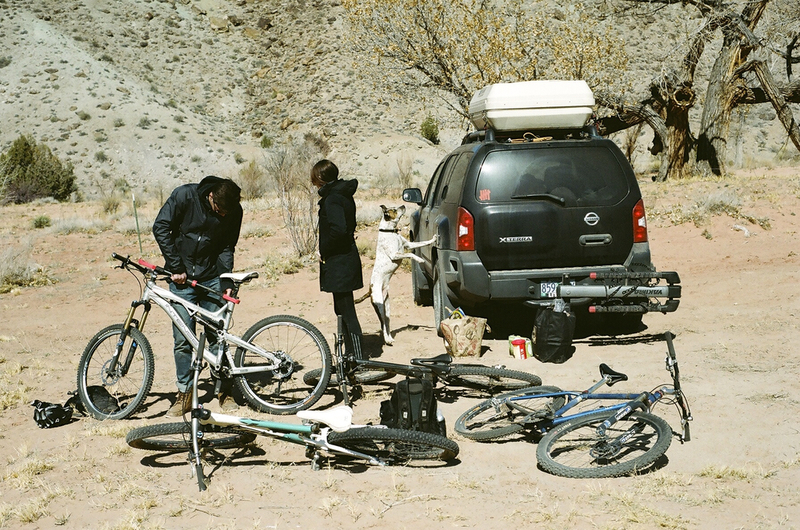 Three weeks later the main characters of this story Tally, Landon, Aubree, Chapter (the token dog companion) and myself hopped in a car with four bikes, tents, and wanderlust. Our first destination was the mecca of Moab via a night stop in Boise. The route took about 14 hours to drive and came complete with truck stops, ice storms, and nachos. Once at our first destination we enjoyed Navajo flat bread tacos while watching the main street traffic roll past. Mountain bikes, and adventuremobiles where in majority along with sunglasses and shorts. We knew it was going to be a great couple of days; we were a long way from Portland and it felt great. We camped at the trailhead to the famed Slickrock playground. On the second night, while enjoying an evening sunset ride on the trail, Aubree and I had a surprising chance come across with a great friend (Bret) who happened to be enjoying his own adventure from Boulder. That night stories of college debauchery and aspirations emanated from our campground with the help of self imported libations from Idaho and Colorado (thanks for the beer Bret). 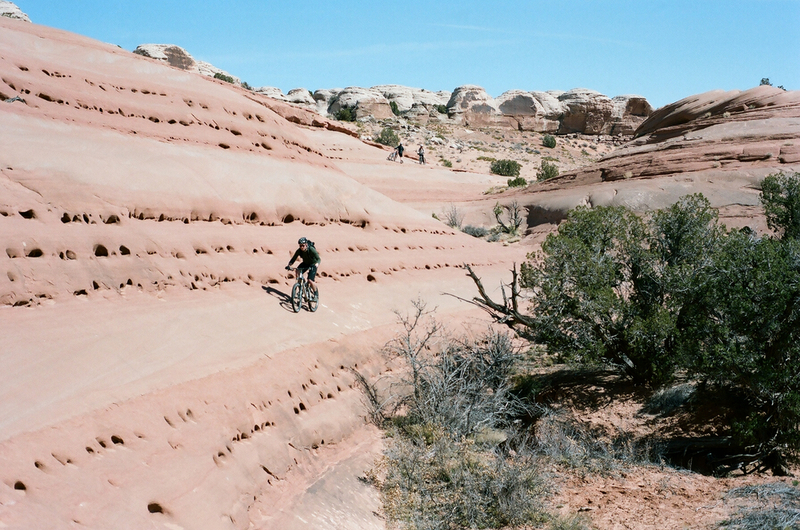 The days to follow included rides on Porcupine Rim trail and Bartlett Wash. Moab’s reputation does little justice to the inspired terrain so readily accessible. With each turn Landon and I continued to push limits of bikes and mind, pursuing dramatic lines and scenic verandahs. We left Moab with the Pacific Northwest moisture sucked from our skin, sunburns as souvenirs, and turned east into Colorado. The drive took us over the Million Dollar Highway and through the almost cartoon mountain towns of Oury and SIlverton. In stark contrast to the red sandstone of Utah, the snow covered peaks of the San Juan National Forest, dotted with retired mining structures and back country ski tracks, were equally picturesque. Once in Durango, we all felt uncommonly settled in a mostly unknown town. 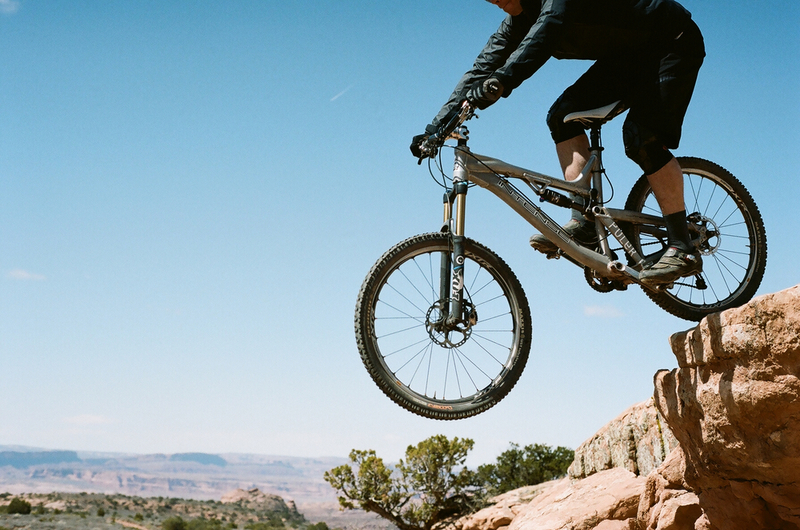 Two nights in a Yurt, a day spent in the fairy tale land of Mesa Verde, and a couple laps at Ned Overend’s test track made a for a destination worthy of future excursions. Heading back west, we travelled through Four Corners, with a quick stop to enjoy the attractions of Page AZ (e.g., Lake Powell and Antelope Canyon), and found ourselves in a taco shop in Hurricane, UT. 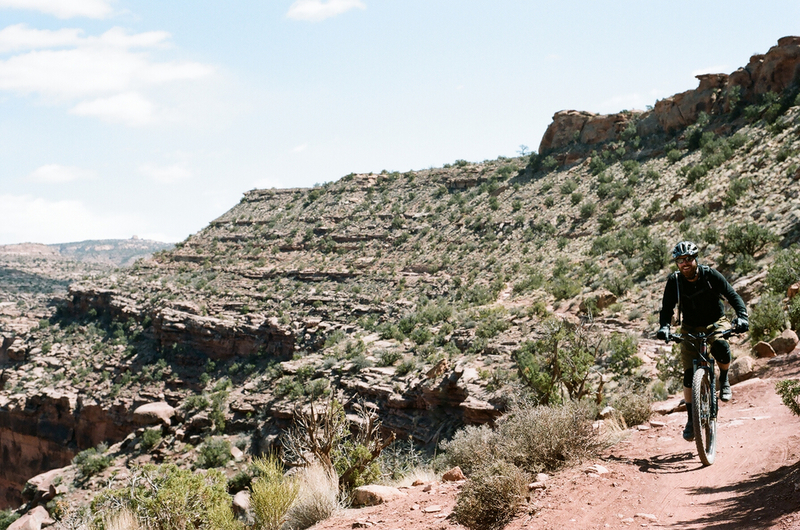 After hoping and failing to find accommodations in town, we backtracked to explore dirt roads and cattle guards in search of a less than well documented campground atop Gooseberry Mesa. Tents were pitched below a full moon and with little idea of where we actually were. We awoke that morning to the sound of mountain bike tires and realized we were pedal strokes away from the trailhead and were sharing our sleeping area with a slew of likeminded riders. Bikes and riders of all ages slowly emerged from hidden campgrounds ready to indulge in the epic views and unique trail system. On our way out of town, as a last salute, we decided to check out the old Red Bull Rampage site. Mostly we wanted to stare in awe at the progression of the sport, but after a quick glance we decided to give a few of the lower lines a go. Fueled by adventure and camaraderie we managed to stay upright although limits were pushed. A quick visit to Zion and we headed back to Portland with stories to tell. Sometimes you just have to find the right time. Bicycles empower riders to seek freedom. Not the gun totting, “I say what I want” kind of freedom . . . rather, the sense of escape type of freedom. Whether searching for freedom from the stressors that seem to eclipse passion or freedom from boredom, cycling sanctions its following to enjoy life a touch more than if there was no “nobelist invention.” A rider can ride for their job or to their job, on the dirt or avoiding dirt, for utility or for futility, and experience the best moments of their day, week, month, or year.